Abuse is Abuse… and it’s Up to Us to Stop it! Eighteen years ago, the landmark Violence Against Women’s Act was passed in this country. The bill provides billions of dollars towards investigation and prosecution of violent crimes against women, imposed automatic and mandatory restitution on those convicted, and allowed civil redress in cases prosecutors chose to leave unprosecuted. The act also set up a specific office for Violence against Women in the Department of Justice. And believe it or not, at this hour, a time in this country in which it seems impossible to get Democrats and Republicans to agree on anything, this bill received wide bipartisan support. To celebrate this landmark legislation and take a stand against the violence that continues to occur behind closed doors, and draped blinds, in our homes, in our kitchens, and in our bedrooms, October is National Domestic Violence Awareness Month. The hope in setting aside a month to raise awareness is that together as a community, we can promote healthy relationships, speak out against injustices in our communities, stand up for and with survivors of abuse, and change attitudes so we don’t perpetuate the cycle of abuse. We need to remind victims of domestic violence that they are not alone – that there is a community here that supports them. We may think that this is simply a noble cause and another case in which the Jewish community is helping those around us. While that is true, this is also about us protecting those in our own community. Statistics show that domestic violence occurs in the Jewish community at the same rate as it does it the larger community: Fifteen percent. 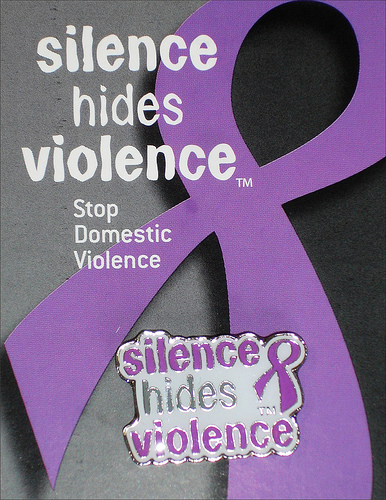 Fifteen percent of Americans are victims of domestic violence and abuse. Fifteen percent in the Jewish community are as well. Such statistics are not limited to a specific stream, movement, or denomination in Judaism. Likewise, they are not limited to a specific socio-economic level or class. Domestic violence includes many forms, and includes issues of power and control. Domestic violence and abuse can be physical, sexual, emotional, financial. Abuse is abuse. There are over 75 organizations specifically focused on Jewish domestic violence. However this is a problem not talked about enough in the Jewish community. According to the Jewish Coalition Against Domestic Abuse, there are several reasons for this. Too often in the Jewish community, we keep secrets. We like to think that if we do not talk about it and address it, then it is not actually a problem in our community. Admittedly, this is something that is not talked about enough, by clergy from the bima, in public forums, in synagogue bulletins. We spoke in great length last year about our mission to combat bullying and create a Community of Kindness for our kids in our schools and yet, we need to do more to combat bullying, violence, and abuse among adults. In the coming days and weeks, you will begin to see information inside bathroom stalls at the Jacksonville Jewish Center about who you can contact and turn to for help if you’re a victim of domestic violence. Our goal is to talk about it more and help victims understand that there are places to go for help. No more keeping it a secret. The Jewish community also deals with shame and embarrassment. 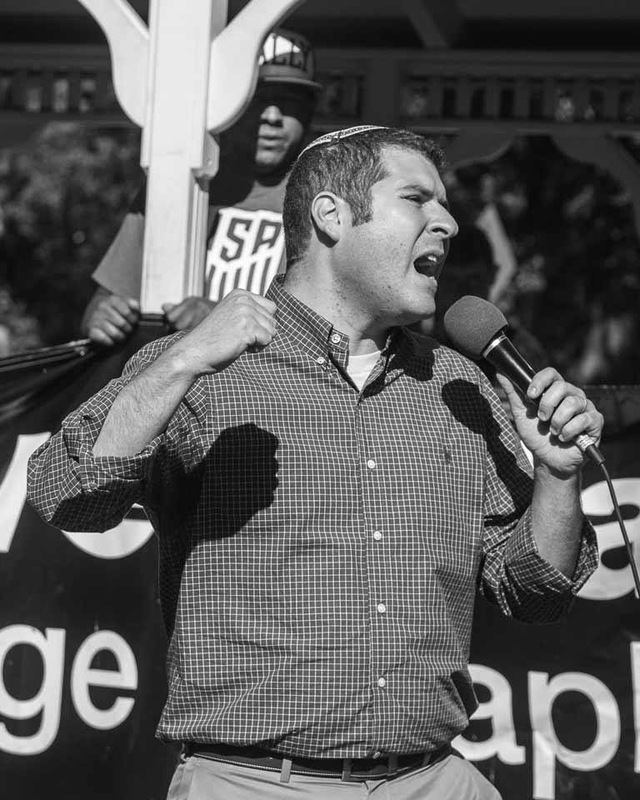 There are those who believe that we don’t publicly criticize, decry, or accuse a Jew of anything because it is a shanda – it brings shame to the Jewish community. Thus, too many institutions continue to embrace abusers and those convicted of such violent acts. Finally, these women – and I say women because statistically, women and children are the primary victims of domestic violence although men are victims as well – are often concerned about Shalom Bayit, peace in the home, and fear that standing up for themselves, their own safety, and the safety of their children, will lead to a change in the family dynamic. Here are the shocking statistics: while the percentage of domestic violence in the Jewish community is equal to that in the larger community as previously mentioned, Jewish women tend to remain within an abusive and violent relationship for two to three times longer than non-Jewish woman. This is true for all of the reasons previously stated above, but the reality is, without more education, advocacy, and awareness within the Jewish community, victims will not feel comfortable taking the heroic, brave, and life-saving step of leaving an abusive relationship. Furthermore, we cannot only talk about it, we need to other an alternative, a world where abuse and violence is not the reality. A world which is no longer broken. The tragedy that strikes the earth in this past week’s Torah portion, Parashat Noach, is unthinkable and inconceivable. We are only into the second portion of the Torah, nine generations removed from the Garden of Eden and human infancy with the creation of Adam and Eve, and yet God opts to hit the reset button. God is not satisfied with the actions of humanity and instead decides to start over with Noah and his family, the righteous of his generation. God wipes out the entire world, save for Noah’s family and two of each creature and animal. And when the flood of forty days and forty nights was over, it took almost two months for the earth’s surface to eventually dry up. Noah disembarks from the ark and doesn’t know what to do. He plants a vineyard, gets drunk, he exposes himself, is sexually immoral; he cannot control his actions. Noah has entered a dark spiral of depression. While the actions of those in the world around him may have been evil, the world he had lived in, the miraculous world that God had created was beautiful. That world had been destroyed. Noah was grateful for his survival, upon exiting the tevah, the ark, he enters a broken world, and a broken state. There is no vegetation. The land is barren. His world is empty. His world is broken and after such tragedy, he is simply just trying to put the pieces together. Parashat Noach, and the story of Noah’s ark is not really about a great flood. We don’t know great details about the evil actions of humanity that led to the destruction of the world. We don’t know great details about what made Noah so righteous. We don’t know why Noah didn’t stand up to God and fight for the survival of humanity. All we know is he built a big boat, rain came, and God destroyed all that was not on Noah’s boat. Then the real story starts – because what this parasha is really about is the aftermath, Noah’s life post-flood. This is about Noah’s broken world and his attempt to pick up the pieces of that world. So how do we pick up the pieces? Police officers in Jacksonville have been wearing purple all month to raise awareness. Women’s shelters and organizations like Hubbard House here in Jacksonville help protect women and children and get them back on their feet, helping them pick up the pieces. Hubbard House, established in 1976, was the first domestic violence shelter in the state of Florida. Now, a certified comprehensive domestic violence center, it is a national leader in interventions and annually provides services to more than 5,000 women, children, and men in Duval and Baker counties. Hubbard House is just one of many places to go for help. Let the Jacksonville Jewish Center be that place as well. Let us serve as a safe haven, a safe space, a sacred space. What is more important is that you, or someone who know who is a victim of domestic violence, finds that safe space and that we, as a community, support them in leaving such an abusive relationship— and will help them putting the broken pieces back together. When the downpour ceased and the floods dried up, a rainbow appeared. In Genesis chapter 7, verse 12, God declares the rainbow as a sign. “Here is the sign I am giving you, a sign of the covenant between me and you and every living being with you.” God adds “When the rainbow is in the cloud, and I see it, it will be a reminder – and I will remember – the everlasting covenant between God and all living beings, all that live upon the earth.” The rainbow is a symbol of survival, of new beginnings, of a better, brighter, and safer tomorrow. Let no one we know, peers, colleagues, and co-workers, relatives and members of our own community, continue to live a life of abuse and violence, in which every day they fear that a storm, a flood, is coming. Instead, let us be the support system needed to help them start a new life, build a new world, and put the broken pieces together. Let us, as individuals, and as community, be the rainbow, to take a stand against domestic violence, end domestic violence, and be a symbol of a better future. Much statistical information gathered for this blog post comes from: Jewish Family and Children’s Services of Jacksonville (JFCSJAX), Jewish Women International (JWI), and the Jewish Coalition Against Domestic Abuse (JCADA). All of these are welcoming and helpful organizations, here to help any victim of domestic violence leave an abusive relationship and any survivor of domestic violence get back on his or her feet. My wife and I took our daughter to see Sesame Street Live last week at the Times-Union Center in Jacksonville. Surprisingly, it was really an amazing and fun show. They used bright colors, songs, and objects to teach words, letters, numbers, and concepts. I don’t have to tell you the impact that Sesame Street has had on society. I am sure you have watched Sesame Street, either as a parent, child, grandparent or someone who was interested in seeing your favorite celebrity interact with a little red monster. Created by Jim Henson, Sesame Street just began its 43rd season on PBS last week and as of 2009, it was broadcast in 140 countries throughout the world. According to Entertainment Weekly, celebrities apparently were lining up to try to get a guest appearance on Sesame Street. They said that this is when you knew you finally made it: you were a success once you were on Sesame Street. And that speaks to Sesame Street’s success. With the creation of Sesame Street, producers used educational goals and curriculum to shape its content for the very first time and the impact is clear: A poll from 2008 showed that 95% of Preschoolers in America had watched at least one episode of Sesame Street by the time they were three. The claim was that this was different than sitting a child in front of a television. The tv was not a babysitter; the tv became t teacher. This was an educational tool – teaching our children letters and numbers, as well as morals and values. According to producers the Children’s Television Workshop, the show uses a strong visual style, fast-moving action, humor, and music. Since they believed that children had a short attention span and couldn’t sit still to learn for an hour, they had multiple different segments throughout a single episode. Episodes were not hour-long storylines and plots. Instead, they were curriculum based short segments, interrupted by puppet sketches, short films, and animations sequences. The same is true for adults. With our busy schedules, we barely have two minutes to stop and sit down. When did we assume that adults could sit still for long periods of time, even though as children we were unable to do so? As first graders, we sat on the floor, colored with our crayons, and moved around the classroom from activity to activity. Then, all of a sudden, as college freshman, we were expected to sit still in a 300-person lecture hall for ninety minutes. The longer we sit still, the more we zone out and become disconnected. This is why many may have trouble connecting to the ideology, theology, and liturgy of the High Holy Day experience. We can’t seem to focus once we are sitting still for too long. Why can’t we return to the interactive and hands-on education experiences of our primary educational years?! Sukkot immediately follows the High Holy Days. Sukkot heightens our senses through the building of the Sukkah and dwelling in it, and the shaking of the lulav and etrog, On Sukkot, we aren’t meant to stay in the synagogue and sit still. We shake, we march, we spend time outdoors. Sukkot is like an episode of Sesame Street. While all cannot and may not sit still for a long lecture, everyone can connect to an episode of Sesame Street. 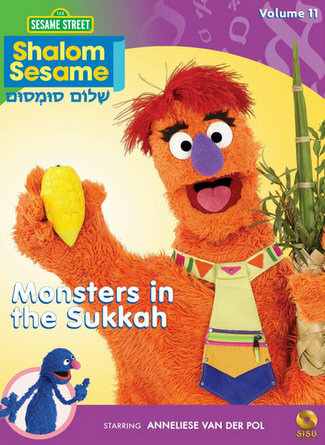 So allow Sukkot to be your educational tool, your version of muppets and monsters. Don’t worry about sitting through the full episode. Challenge yourself by participating through a short segment: spend an afternoon dwelling in a sukkah, take a moment to shake the lulav and etrog, march around with the four species instead of sitting still in the pews. Each experience is but a couple of moments and yet, each experience allows us to connect with God and community in a way that we find challenging on Rosh Hashanah and Yom Kippur. The amazing thing about sitting with my daughter and watching an episode of Sesame Street is that she talks to the television. Elmo or Big Bird or some other muppet looks directly into the camera and asks the viewer a question. She (and I’m sure most children) respond as if she is having a private conversation with the Sesame Street characters. The show is meant to be an interactive experience. The same is true for Sukkot. We do not sit still. We do not zone out, stand up, sit down, stand up, and sit down. We participate! So, take a lesson from Elmo and participate, even if just for a moment. Participating for a moment is more rewarding than sitting still for hours.